Originally published on Finding Todd. 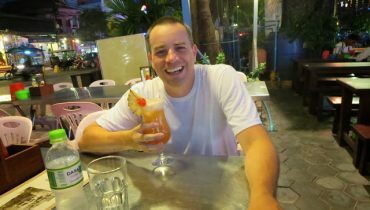 The following happened during my trip to Cambodia. 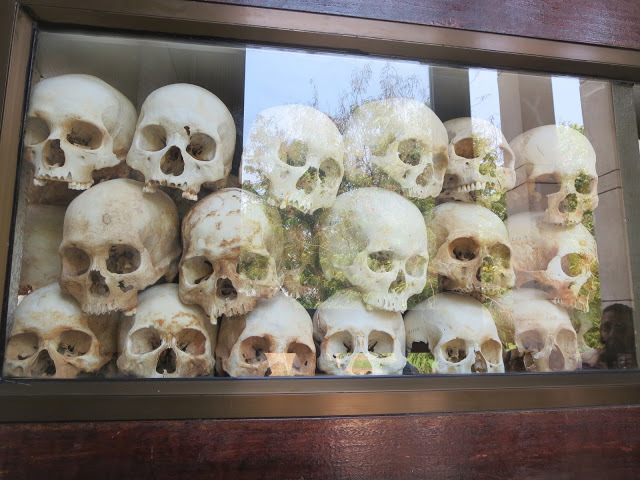 It was a very somber day as I toured the historic Killing Fields in Phnom Penh. Well, on the heal of yesterday’s two part blog entry and 200+ photo total, I followed it up with another 100 photos today. 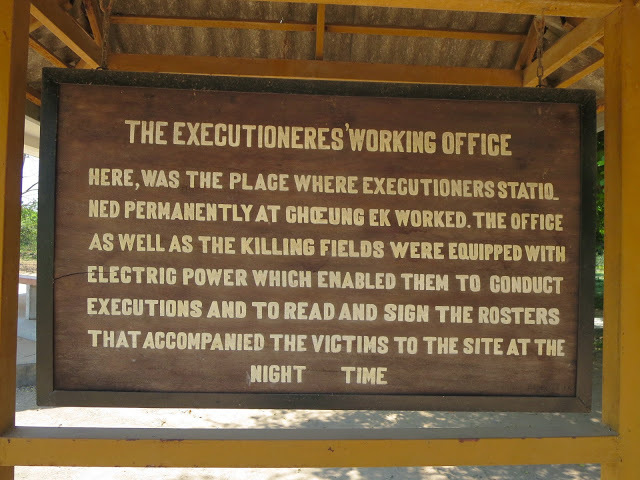 Today was another action packed day as I went out to the killing fields and to S-21, the infamous Tuol Sleng prison now turned into a Genocide Museum. So, while yesterday was a pretty light day looking at temples, sunsets and amazing architecture. Today was the polar opposite reflecting on pain and suffering in the not too distant past. Yes, today was a heavy day. It was also a necessary day. 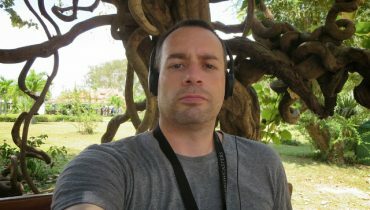 As with the day when I visited the Vietnam War Museum in Ho Chi Minh City, today was a great education for me as well. As I said on that day, I never really was into history so I never learned about everything going on in the world. Yeah, there were some wars going on but they were happening to foreigners in a foreign land. Well, now that I’m older and wiser and in these foreign lands my interest has picked up immensely. I want to learn. I want to get my head out of the sand and know what exactly went on. Even if what you learn is horrible. 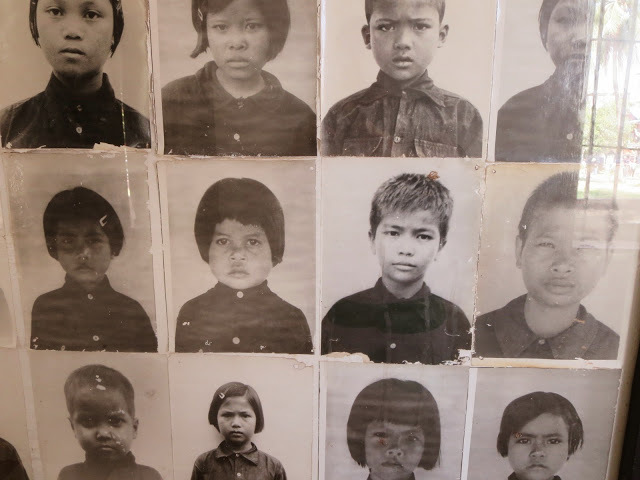 Back in 1975, not even 40 years ago, there were genocide atrocities happening here in Cambodia. 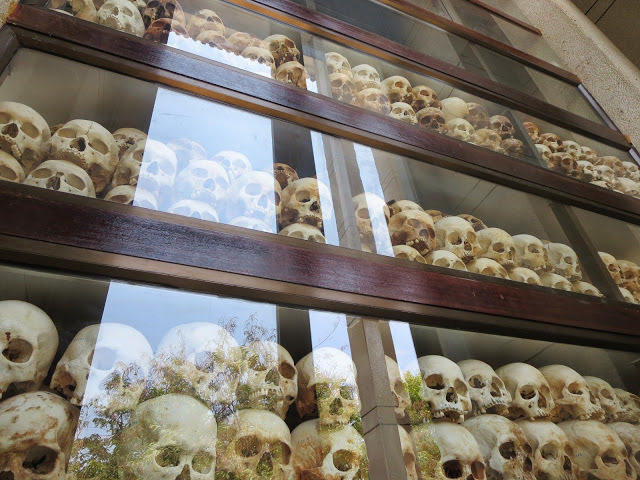 The Khmer Rouge and its’ leader Pol Pot decided one day to just take over the country. 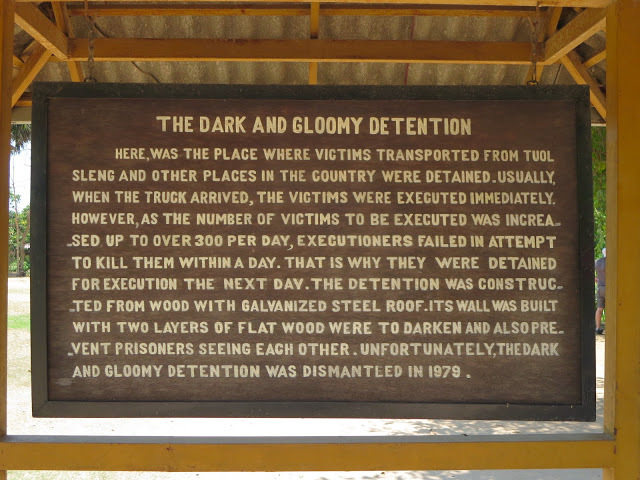 Over a span of 4 years over 3 million people, including children, were tortured and executed. 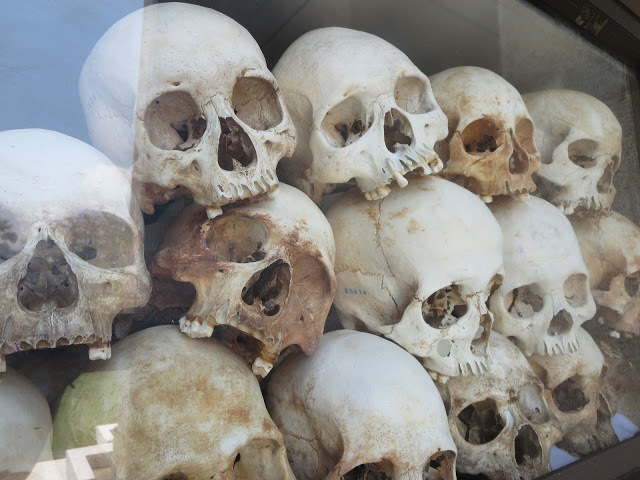 I left my hostel at 10am hiring a tuk tuk driver to take me out to the killing fields for $18. 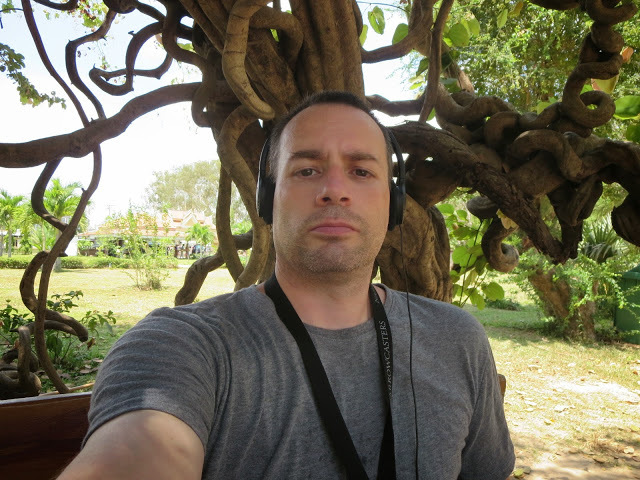 Sadly this trip is the biggest tourist thing going here in Phnom Penh. 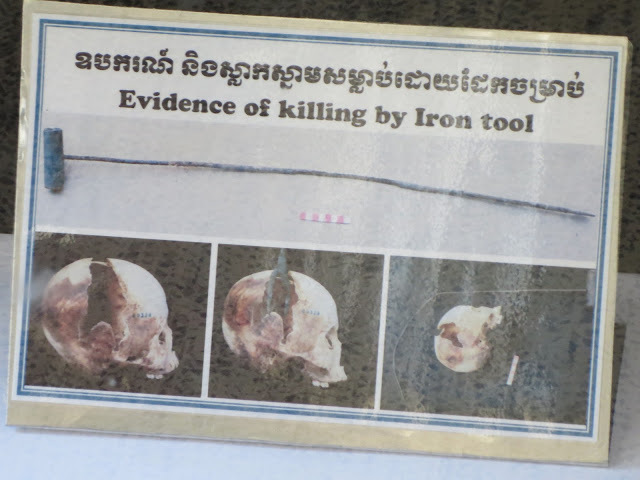 When people ask you what to do in Phnom Penh, inevitably the answer is always Oh, you have to see the killing fields and S-21! In fact this was the only reason I came here as I was only spending the one full day here before leaving for Bangkok tomorrow afternoon. The ride out to the killing fields took a good hour to get to and it was mostly through small neighborhoods. 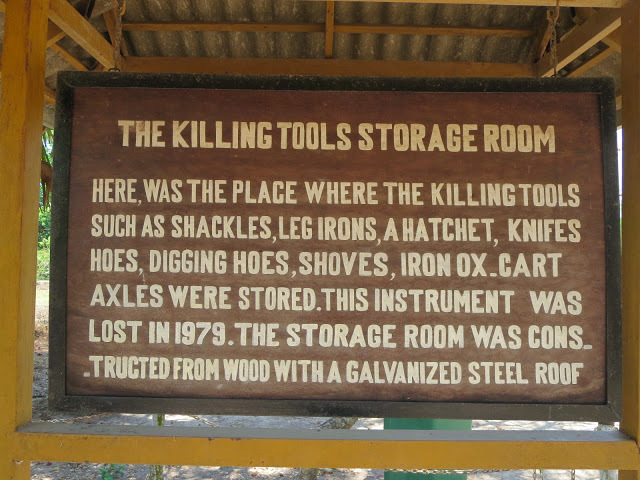 Unlike the typical museums which are always placed somewhere convenient for tourists to get to, the killing fields are anything but. 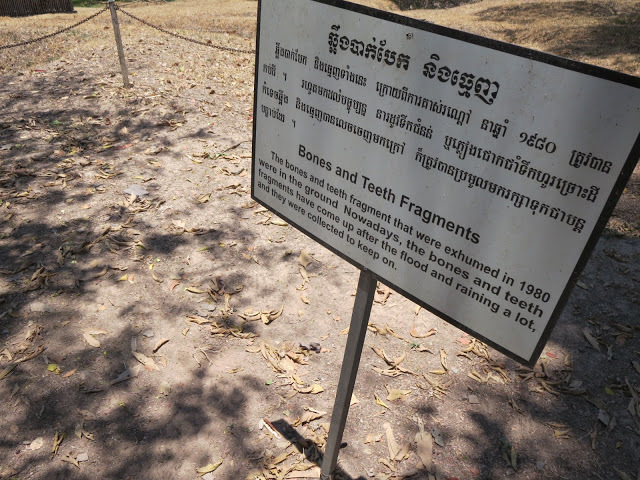 This is, after all, not a museum but the actual mass grave site of thousands of Cambodians. I paid my $6 entry fee which included a free audio headset and then headed inside to walk around the grounds. That walk took me almost 2 hours as I stopped at each of the 18 stations listening intently to what the man on the audio headset had to say. At the beginning of the tour the stations to stop at were where buildings used to be. Now there are just simple signs designating what used to be there. 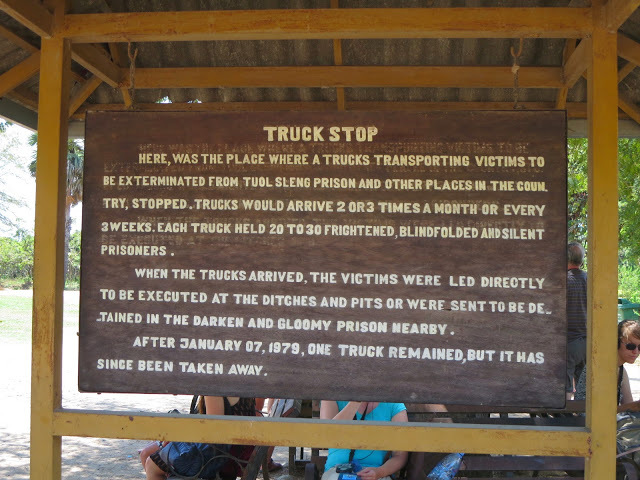 Of course this makes sense because when it all ended in 1979 the first thought of the liberated Cambodians wasn’t Hey, we should leave everything just the way it is so we can turn it into a tourist attraction! Nope, rightfully their first reaction was: Tear this mother down! 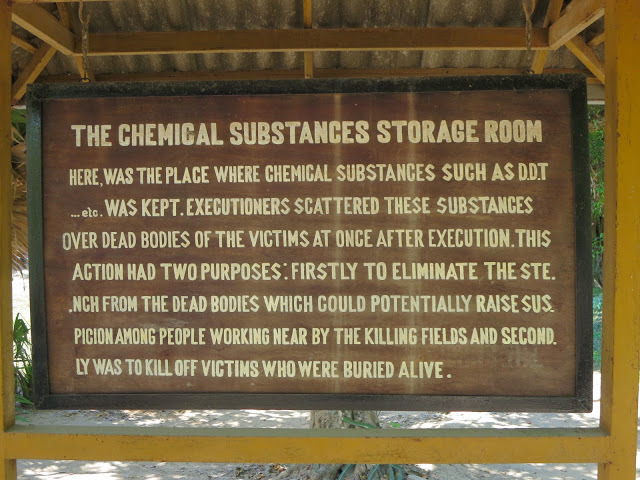 Next were the actual mass graves. 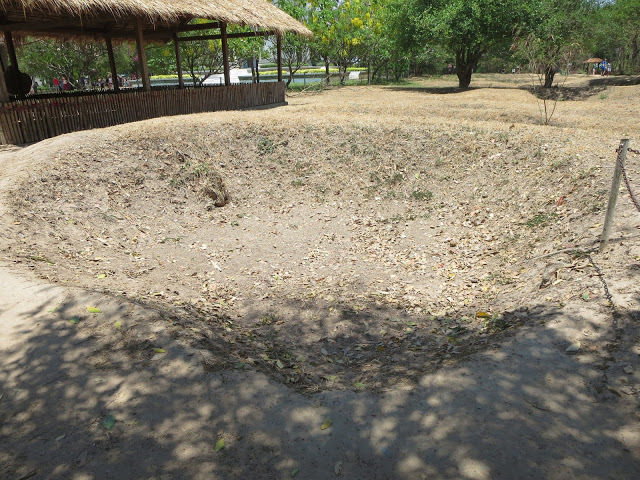 Most of the grave sites have long had the bodies exhumed but you can still see the craters of where the graves once lay. 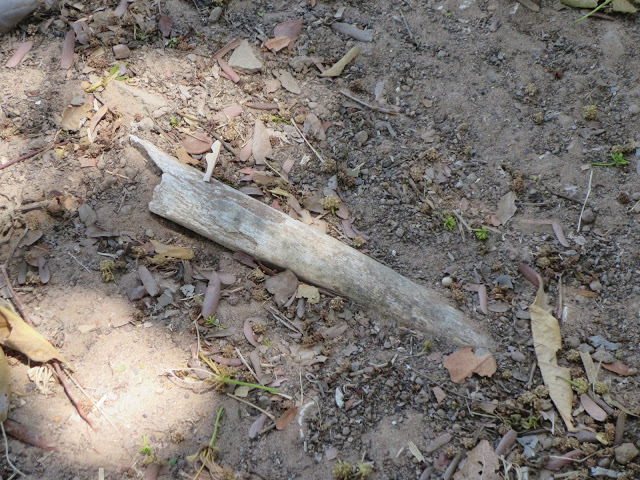 As the dirt drifts with the wind or the water pieces of tattered clothes and bone fragments will still occasionally surface. A constant reminder of what was (and still is) in the ground. 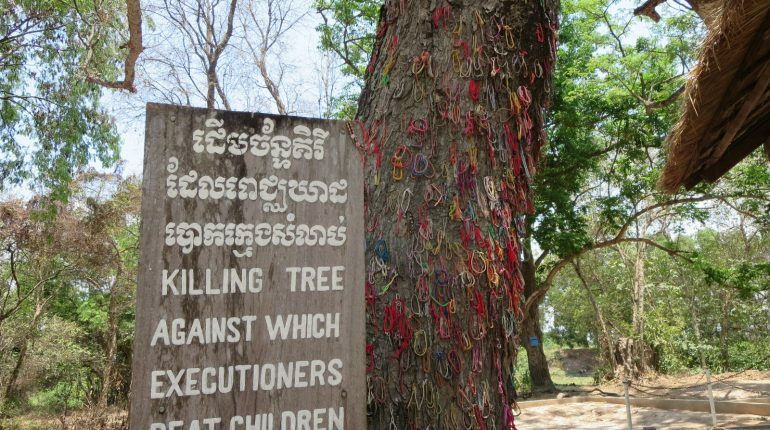 One of the most moving things you see on your travels through the killing fields is The Killing Tree. 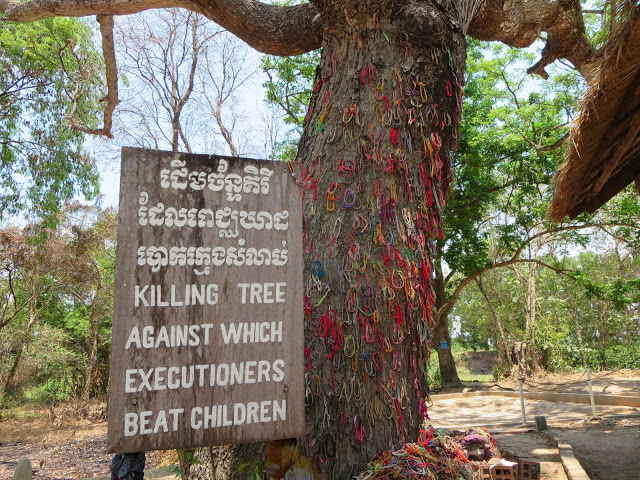 It is literally a tree that was used to kill young children. 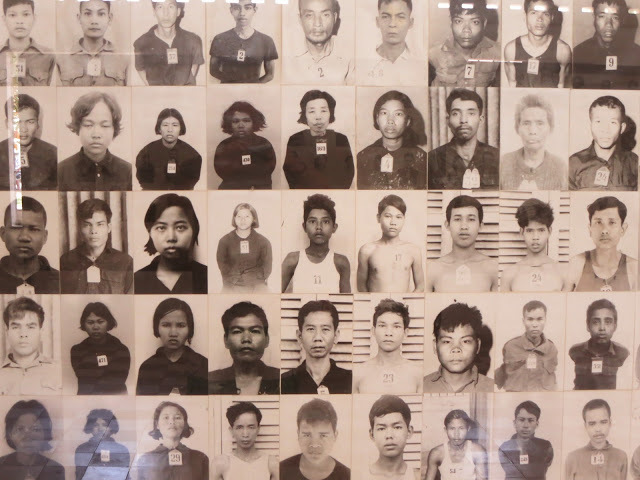 The Khmer Rouge would take kids, hold them by their legs and repeatedly bash their heads into the trees killing them. Then they would throw their naked bodies into a grave right next to it. 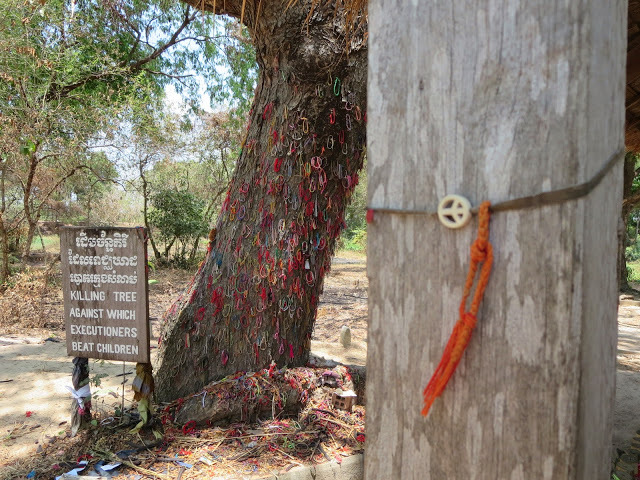 At the time of the atrocities the tree was blood stained and had brain matter and skin on it. 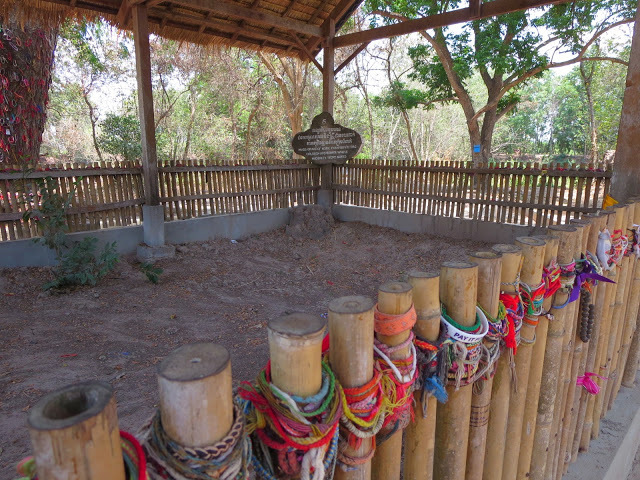 Now it stands as a memorial as visitors leave their wristbands behind. 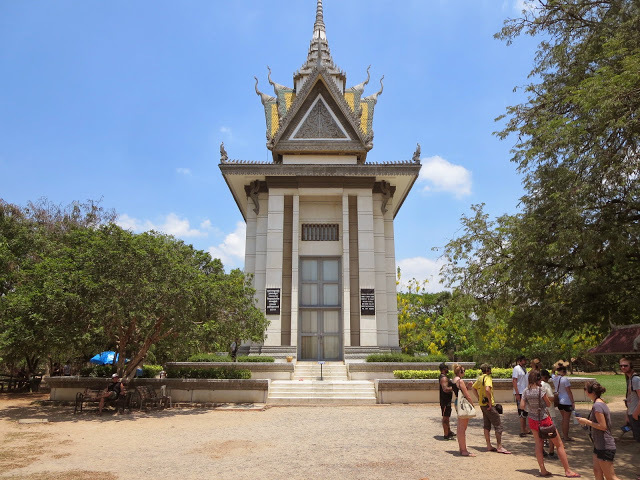 The final stop of the tour is a memorial stupa – a giant building housing thousands of skulls and bones found at the site. 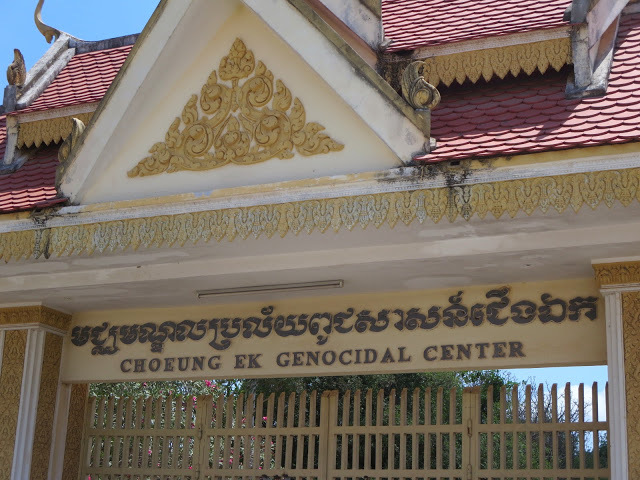 After touring the grounds I stopped by the museum where I watched a short film on the genocide. It was interesting to see everyone else today as you could literally hear a pin drop as people walked from station to station in complete silence. I left the killing fields just after 1pm and found my tuk tuk driver. The former prison is just outside of the main city and has now been turned into a museum. 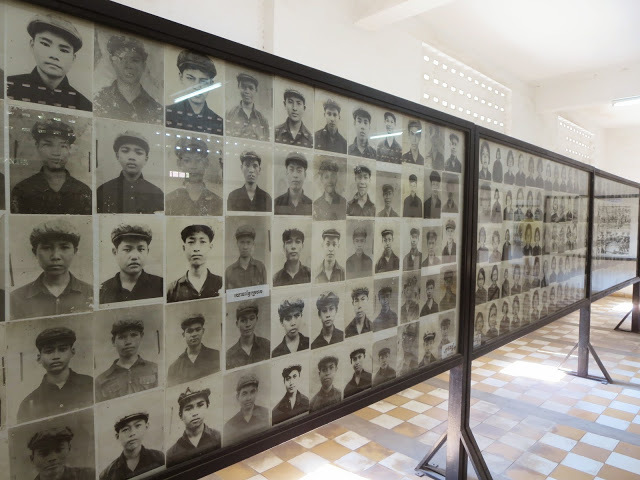 There are still actual cells still there and some rooms have been turned into displays of photos of the former prisoners. There was also a room with books of false confessions coerced through torture. I spent some time reading some of these letters about how they worked for the CIA or stole something from the Khmer Rouge and seeing their signatures and thumbprints at the bottom. You can only imagine what they had to go through to finally submit and write these letters. 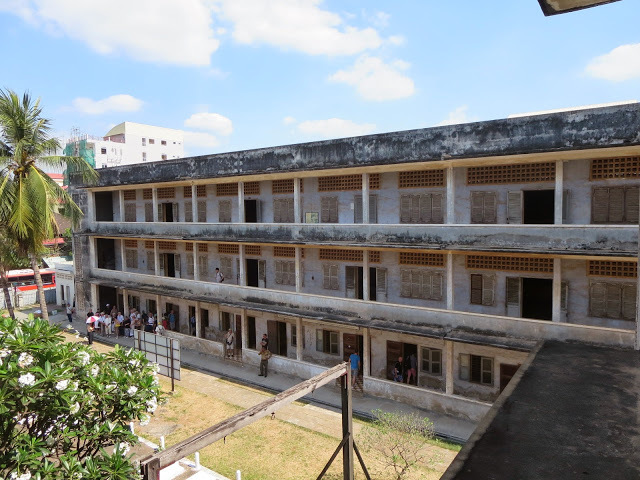 This prison housed alot of people – if you wore glasses, had soft hands, were a teacher, or any one of a number of other things that the Khmer didn’t like – you were sent here. And eventually sent to the killing fields. It truly was an eye opening event and I’m ashamed to say that I never knew about any of this and that it took a trip half way around the world to get me to learn about it.